The biggest question coming into Evo 2018’s Super Smash Bros. Melee competition is whether or not one of the game’s “gods” would win a sixth title in a row. And now, we have our answer: the gods are dead, long live Leffen. After an intense weekend of competition, eight competitors entered the Mandalay Bay Events Center in search of Super Smash Bros. glory. Among them were three of the community’s strongest players: Adam “Armada” Lindgren, Juan “Hungrybox” Debiedma, and Joseph “Mango” Marquez. 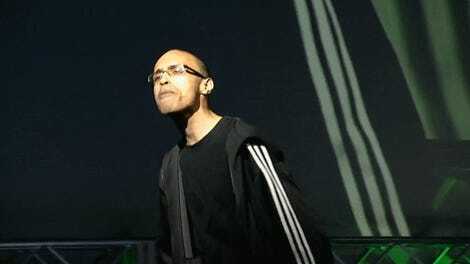 (Shockingly, fellow god Jason “Mew2King” Zimmerman got eliminated before the finals). All eyes were one of this trio to grab Evo 2018’s title, but their fellow finalists wouldn’t go down quietly. The most promising competitors coming into Sunday were two prominent god-killers. William “Leffen” Hjelte and Justin “Plup” McGrath are no strangers to high-level competition, and both have defeated their share of gods in the past, albeit on smaller stages than Evo, the biggest and most prestigious fighting game tournament in the world. As the matches began, it was clear these players were hungry for a win. Leffen came out strong against Hungrybox, sending the floaty Jigglypuff to the loser’s bracket, while Plup dispatched Mango without giving up a single game. In winner’s finals, Leffen showed no signs of stopping, stunning Plup with a lightning-quick 3-0 beatdown. Armada took an entirely different path. As the reigning Evo champion, his loss to James “Swedish Delight” Liu during competition pools came as quite the shock, and he was forced to claw his way into top eight through the losers bracket. Once there, however, he played like a man possessed, dropping ranked players and fellow gods in tight, efficient matchups. It was against Hungrybox that he looked most dominant, utilizing Peach’s tools to counteract Jigglypuff’s deadly spacing abilities. And when it came time to face Plup, he was ruthless, surging through losers finals without looking back. The grand finals were an entirely Swedish affair, with Armada’s magnificent pedigree heading off Leffen’s hungry challenge. Armada chose to run Fox against Leffen’s own Fox, a mirror match that frequently leads to stalemates due to the similarities in tools that each player can use. Unfortunately for Armada, Leffen had the upper-hand. The so-called god was forced to switch to his old standby, Peach, in an effort to stave off Fox’s relentless assault. It all came down to one final game on Final Destination, the flat, featureless stage that has become the most ubiquitous of Melee’s arenas. With the Evo title slipping from his grasp, Armada used every tool at his disposal to avoid Leffen’s rushdown, floating around the stage and surveying the landscape before committing to anything. 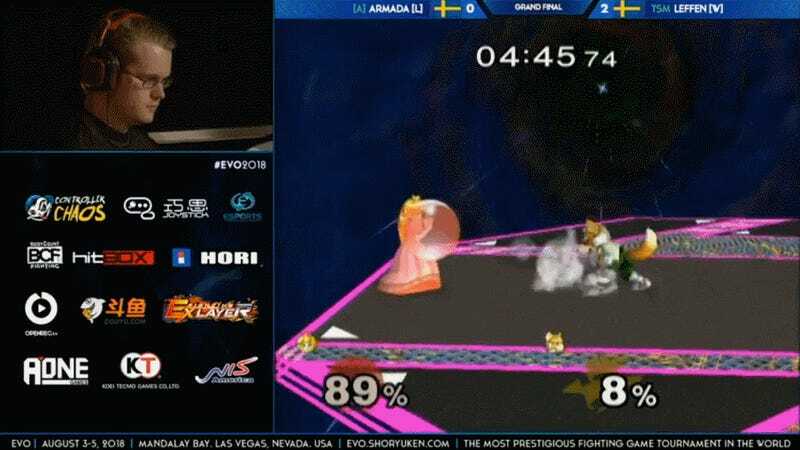 But in the last few seconds, Leffen was able to catch Armada with a grab, throwing him into the air for one final attack and sending him sailing into the background. The importance of this moment radiated from Leffen. He rose from his chair, looking as if a great weight had been lifted from his shoulders. At long last, he had scaled the mountaintop, pulling the gods down to his level and securing one of the greatest titles in the fighting game community. Evo 2018 belonged to him.